Spring is without a doubt one of my favorite times of year. The weather takes a turn for the better, flowers begin to bloom, markets overflow with fresh produce and both the International Association of Culinary Professionals (IACP) and the James Beard House announce the annual awards to new cook books within the culinary world. 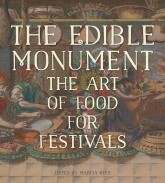 Many of the books I’ve collected in my library have been either IACP or James Beard award recipients. While I always look forward to this season for the new book arrivals, I can’t help but wander back to the classics which have shaped all our lives in the kitchen. Here are the top ten books that I would highlight as the most influential literature on cooking since printing began. They vary extensively in term of date and focus and all of them are essential reading. 1. Bartolomeo Scappi “Opera” (1570): A cook to cardinals and the Pope, Scappi applies renaissance order to the scattered art of cookery. 2. Hannah Wooley “The Queen-like Closet or Rich Cabinet” (1670): A trailblazer in the United States, this book was re-printed many times. 3. Antonin Carême “L’Art de la Cuisine Française” 5 volumes (1833-47): A chef to kings and statesmen – Carême masterminded international cuisine in the aftermath of the French Revolution. 4. Auguste Escoffier “Le Guide Culinare” (1902): Cooks still consult Escoffier. He reduced French cooking to shorthand which made a huge repertoire of dishes in the kitchen. 6. Elizabeth David “French Provincial Cooking” (1962): Elizabeth is as much a great essayist as cook and the combination is irresistible. 7. Julia Child “Mastering the Art of French Cooking” (1963): The title tells it all. Julia is a master of communicating her thrill when cooking in the kitchen. 8. Harold McGee “On Food and Cooking” (1984): Harold reveals a very contemporary inside look at food chemistry. 9. Alan Davidson “Oxford Companion to Food” (1999): Alan’s curiosity and quirky sense of humor leads to the most authoritative food dictionary of our generation. 10. Nathan Myrhvold “Modernist Cuisine” (2001): Nathan has the brilliance to pin down images and text. Modernist Cuisine has inspired and shocked the current generation of chefs. 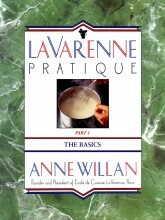 La Varenne Pratique is still my all time go to resource! 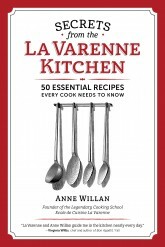 Where can i buy La Varenne Practique.? Jane George ex student of Anns. You can buy it used on Amazon!